Join Carla Stanton, member of First, certified spiritual director and mom of three, in room 201 every Tuesday morning, 9-10am. At Parent Share, we pray and talk about raising our children faithfully. Childcare is available, too, during either session. The Fourth of July falls on a Wednesday this year, and there will be no worship service that day. The office will be closed on the Fourth. Sugar Creek Explorer Day Rescheduled! Sugar Creek has asked us to reschedule, so… for children entering grades 1-5, on Thursday, July 12, 7:30am-4:15pm. Why? Experience a day at Sugar Creek (a parent is welcome/preferred)! How: Carpool/van/bus from First Lutheran! Additional info: wear tennis shoes and bring swimsuit and towel. Snacks, lunch and water are provided! Cost: $20. RSVP to beth@firstlu.org. The Sunshine Boys serve at First on the first Thursday of each month; the next meeting will be Thur., July 5, at 9am. The Sunshine Boys are an informal group that performs a variety of necessary tasks around the church; such as grounds clean-up, minor repairs, and other small jobs. Rolls and coffee are supplied to replenish your reserves! Dues are free! Contact Mike, our custodian, with any questions: mike@firstlu.org. This group is for parents/guardians and their children ages birth to 3 years old, and meets the second Sunday, at 9:15am in room 102. We sing, dance, play, and pray together to learn ways to raise our little Christians in the home. We welcome newcomers all the time—join us! Human Rights Day, July 10, 4:30–6pm, here at First Lutheran, Onalaska. Potluck meal; bring donations for New Horizons. Vince Hatt will be speaking on human rights. All are welcome to join a 6-week study of the first half of Brene Brown’s book, The Gifts of Imperfection. Reading and thoughtful discussion required each week. Meeting as a group will include watching a video, discussion and sharing. Beth Miller will lead the group. 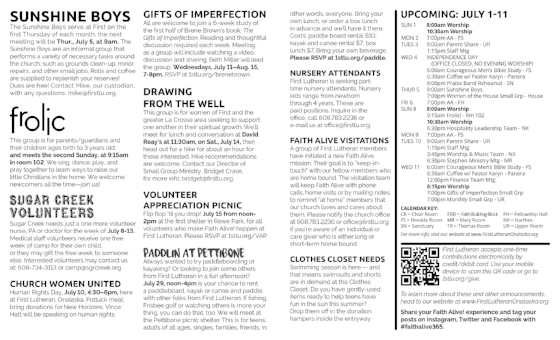 Wednesdays, July 11–Aug. 15, 7-8pm. RSVP at 1stlu.org/brenebrown. This group is for women of First and the greater La Crosse area seeking to support one another in their spiritual growth. We’ll meet for lunch and conversation at David Reay’s at 11:30am, on Sat., July 14, then head out for a hike for about an hour for those interested. Hike recommendations are welcome. Contact our Director of Small Group Ministry, Bridget Crave, for more info: bridget@firstlu.org. Flip flop ‘til you drop! July 15 from noon-2pm at the first shelter in Rowe Park, for all volunteers who make Faith Alive! happen at First Lutheran. Please RSVP at 1stlu.org/VAP. Always wanted to try paddleboarding or kayaking? Or looking to join some others from First Lutheran in a fun afternoon? July 29, noon-4pm is your chance to rent a paddleboard, kayak or canoe and paddle with other folks from First Lutheran. If fishing, Frisbee golf or watching others is more your thing, you can do that, too. We will meet at the Pettibone picnic shelter. This is for teens, adults of all ages, singles, families, friends, in other words, everyone. Bring your own lunch, or order a box lunch in advance and we’ll have it there. Costs: paddle board rental $10, kayak and canoe rental $7, box lunch $7. Bring your own beverage. Please RSVP at 1stlu.org/paddle. First Lutheran is seeking part-time nursery attendants. Nursery kids range from newborn through 4 years. These are paid positions. Inquire in the office, call 608.783.2236 or e-mail us at office@firstlu.org. if you’re aware of an individual or care giver who is either long or short-term home bound. Swimming season is here — and that means swimsuits and shorts are in demand at the Clothes Closet. Do you have gently-used items ready to help teens have fun in the sun this summer? Drop them off in the donation hampers inside the entryway. This new ministry needs warm and friendly faces to greet guests and worshipers who come into the parking lot, giving help if needed at the entrance door and giving umbrellas to those who need one when it’s raining. Come to the Welcome Center to receive more information and sign up to help. We know there are a lot of RANDOM ACTIVITIES that you plan at the last minute, and that it’d be fun to meet up with other folks. This is where RAFL comes in: it’s a Facebook Group created for members of First to invite one another on random activities. It’s a great way to get to know others in the congregation better in a social setting, in an informal way. Join the group at 1stlu.org/RAFL.